Currently viewing the tag: "U.S. Government"
I remember hearing Oracle’s President and Chief Financial Officer Safra Catz speak a few years ago at a conference I was able to attend. If you’re not familiar with her she happens to be one of the highest, if not the highest, compensated women in the world. Aside from that fact she works for the co-founder of Oracle Larry Ellison; it in itself not an easy task she noted. What struck me immediately in her description of operations at Oracle was the “independent operations” that each geographically separated division of the company was doing. Having arrived in 1999 at Oracle she noted that it was effectively divisional chaos; divisions doing similar non-coordinated things all over with little contribution toward building upon the large corporate strategy. Larry had brought Safra on at Oracle to fix this massive problem. As I listened I couldn’t help but feel that this issue having been recognized at Oracle in the early part of the last decade had not been faced or embraced within the U.S. Government. I could only identify a few examples in our Military and even less withing the U.S. Navy. But this was during the time when taxpayer money flowed at a much faster and less scrutinized rate than that of 2012. 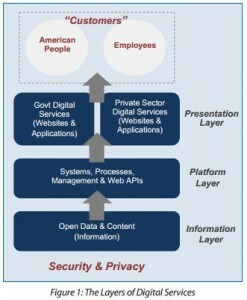 With this context I’m ecstatic to see the release of the Digital Government: Building a 21st Century Platform to Better Serve the American People by the U.S. Chief Information Officer (CIO). Early mobile adopters in government—like the early web adopters—are beginning to experiment in pursuit of innovation Some have created products that leverage the unique capabilities of mobile devices. Others have launched programs and strategies and brought personal devices into the workplace. Absent coordination, however, the work is being done in isolated, programmatic silos within agencies. An “Information-Centric” approach—Moves us from managing “documents” to managing discrete pieces of open data and content17 which can be tagged, shared, secured, mashed up and presented in the way that is most useful for the consumer of that information. A “Shared Platform” approach—Helps us work together, both within and across agencies, to reduce costs, streamline development, apply consistent standards, and ensure consistency in how we create and deliver information. A “Customer-Centric” approach—Influences how we create, manage, and present data through websites, mobile applications, raw data sets, and other modes of delivery, and allows customers to shape, share and consume information, whenever and however they want it. A platform of “Security and Privacy”—Ensures this innovation happens in a way that ensures the safe and secure delivery and use of digital services to protect information and privacy. The remainder of the document puts forth the more detailed aspect of each of these objective and how the principles should be implemented. It should open the eyes of the digital immigrants within the USG. With any new strategy this will take time for the USG as a whole to migrate toward. I simply wish that this would have received this amount of attention and backing when the USG could have avoided these extreme budget conditions. Imagine if this would have been released in 2008; the USG would be in a lot better condition both in the realm of information and fiscal effectiveness. The technology was there then… apparently we had our priorities a bit misaligned. The RAND Corporation has an excellent summary of the U.S. Government-Wide and Department of Defense (DoD) Definitions of Research and Development (R&D). This helps show the differences between the full government’s view and the DoD specific labeling (6.1, 6.2, 6.3…). This break down in the definitions of R&D is also referred to as the Government’s “Color of Money” which is simply the variant of Government dollars that a program or project can accept or a funding entity may be able to provide. This is extremely important to understand when planning the Navy Budget. Basic Research (6.1) – Systematic study directed toward greater knowledge or understanding of the fundamental aspects of phenomena and/or observable facts without specific applications toward processes or products in mind. Applied Research (6.2) – Systematic study to gain knowledge or understanding necessary to determine the means by which a recognized and specific need may be met. Advanced Technology Development (6.3) – Includes all efforts that have moved into the development and integration of hardware for field experiments and tests. Demonstration and Validation (6.4) – Includes all efforts necessary to evaluate integrated technologies in as realistic an operating environment as possible to assess the performance or cost reduction potential of advanced technology. Engineering and Manufacturing Development (6.5) – Includes those projects in engineering and manufacturing development for Service use but which have not received approval for full rate production. Research and Development Test & Evaluation (RDT&E) Management Support (6.6) – Includes R&D efforts directed toward support of installation or operations required for general R&D use. Included would be test ranges, military construction, maintenance support of laboratories, operations and maintenance of test aircraft and ships, and studies and analyses in support of R&D program. 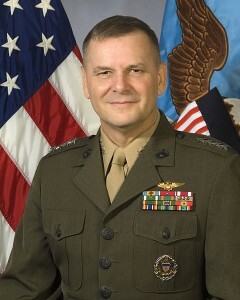 Operational System Development (6.7) – Includes those development projects in support of development acquisition programs or upgrades still in engineering and manufacturing development, but which have received Defense Acquisition Board (DAB) or other approval for production, or for which production funds have been included in the DoD budget submission for the budget or subsequent fiscal year. Developmental Test and Evaluation – Efforts associated with engineering or support activities to determine the acceptability of a system, subsystem, or component. Operational Test and Evaluation – Efforts associated with engineering or support activities to determine the acceptability of a system, subsystem, or component.